At our sister publication, MarketingSherpa, we publish four case study beats – B2B, B2C, Email and Inbound – with stories covering actual marketing efforts from your peers each week. 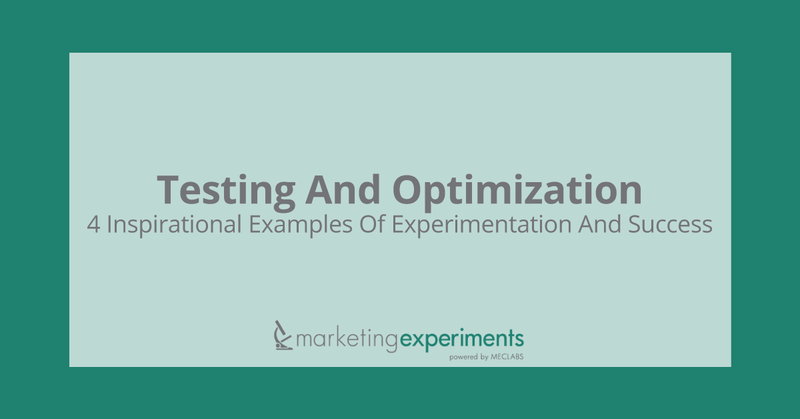 Not every case study features a testing and optimization element, but many do. For this MarketingExperiments Blog post, I wanted to share a quick summary of several of these case studies, along with links to the entire article (including creative samples) in case any pique your interest and you want to dig into the entire campaign. So, without further ado, read on for four MarketingSherpa case studies that feature testing and optimization of various digital marketing channels, strategies and tactics. This case study features AwayFind, a company that provides mobile email alerts, and covers an effort to test, and hopefully improve, its homepage performance. The testing included both changing copy and layout elements. The main copy change was instead of focusing on features, the treatment copy focused on benefits, and layout tweaks included a shortened headline, the remaining copy was split between a subhead and a smaller block of text, and the color of the subhead text was also modified. Here you will learn how Obama’s 2012 presidential campaign implemented daily testing on its massive email sends. Almost 24 writers crafted email copy and subject lines on a daily basis. Four to six email versions were selected for each daily national email, and each version was brainstormed for three subject lines (12-18 subject lines in total each day). Each email’s copy was then tailored for different segments within the list – a donor with payment information already provided would get a “quick donate” option, others might get a “Don’t wait until the last minute” message. This combination of copy message and subject lines was sent to select groups within the list – copy first and the subject line next, and the winning copy and subject line were combined to be sent to the entire list. The process was repeated daily, sometimes multiple times per day, over the space of one month to achieve the best results. The email marketing program was attributed with almost $500 million in donations to the presidential campaign out of about $690 million total. Global technology company SAP has a Test Lab that does just what you think it probably does – constantly tests its digital activities. This case study is an overview of how that lab operates within SAP and provides a high-level view of an overall testing strategy and culture that can provide some insights into how to implement an organized testing and optimization program at your company. Some of the highlights include the importance of having a “single source of truth” with data analytics, the elements SAP found key to form a basis for its testing program, why a testing queue is important in an optimization program, and how retaining discoveries from previous tests can help streamline the process. Having a “testing culture” in place can make implementing and executing an extensive testing and optimization program so much easier on a marketer. Because of this welcoming culture, he decided to run a somewhat quirky test on email sends. This test involved using code to place symbols – such as a star or a triangle – in the subject line, along with the subject line copy. How did this unusual test turn out? Symbols produced a small – 1.5% – but consistent lift in open rate without harming the email reputation score, no increase in “junked” mail, and no noticeable impact on unsubscribes or abuse rates. Great article! Regarding case 1, heat maps are good too for layout changes.